The wheels have been mounted and the main electric wiring is in place. 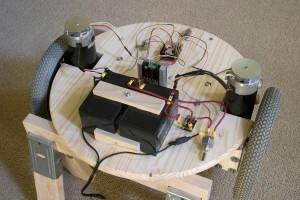 The two batteries are wired up in parallel for a 12V power supply resulting in a maximum motor speed of about 60 rpm . The motors could be supplied with 24V but at least for now the power and speed that I get out of 12V is enough. 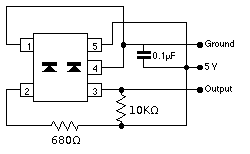 The corresponding signal is provided by the Arduino controller. Currently (for testing purposes only) the motor speed is controlled by a 100k potentiometer that is hooked up between ground and 3.3V with its wiper connected to an analog input of the controller. The resulting Arduino program is listed below. 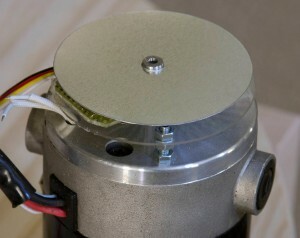 The space on top of the motor is wide enough to mount the two photo reflectors in one line which simplifies the calibration. 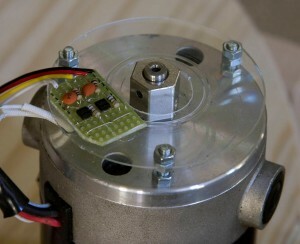 The two photos below show the circuit board mounted on the back of the motor first without and then with the encoder disk attached to the motor shaft. The board is glued to a plastic disk that is attached to cut off screws. This setup allows me to easily fine tune the distance between the sensors and the encoder disk. I tried to create the encoder disk with Scott Boskovich’s encoder design program which can be downloaded fromhttp://www.societyofrobots.com/sensors_encoder.shtml but the output was too coarse. Instead I created a C# console application that builds up the encoder disk as an SVG (scalable vector graphics) file which I then open and print from Inkscape (my robot arm calibration page has more details). 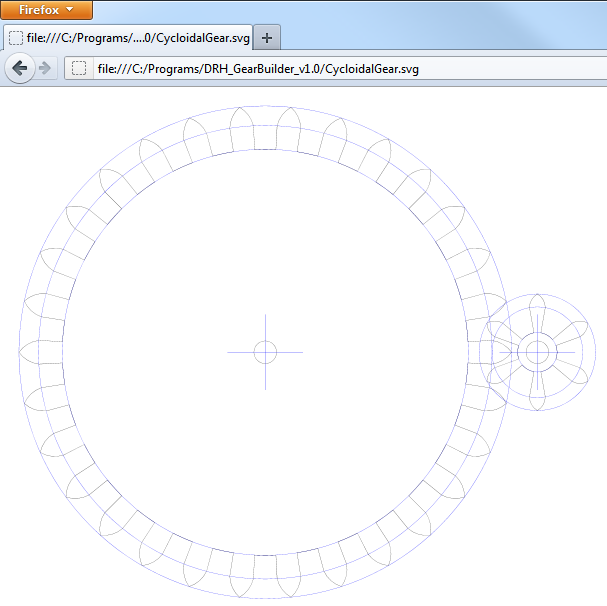 The C# GridBuilder source code code requires .Net 2.0 and either VisualStudio 2008 or the open source IDE SharpDevelop. In order to reliably detect the encoder wheel transitions external interrupts need to be used in the Arduino program. I can highly recommend the Arduino Playground article ‘Reading Rotary Encoders‘ which provided invaluable information for my implementation. 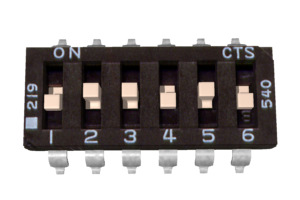 The main part of the encoder logic is encapsulated in the QuadratureEncoder class. It heavily borrows from mikkoh’s contribution to the Arduino Playground article. The SendInfo is used for calibration purposes (see below). 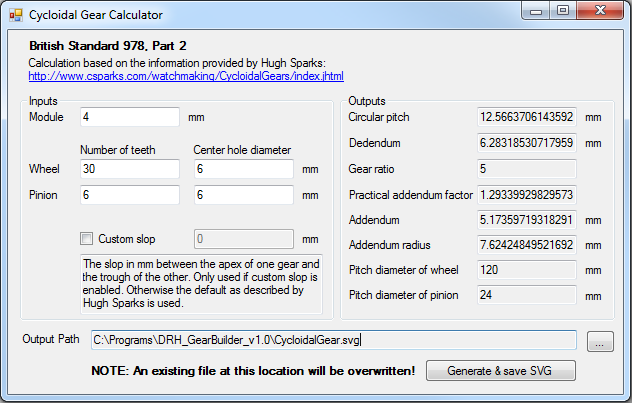 QuadratureEncoder.h - Quadrature encoder library. Dr. Rainer Hessmer, April, 2010. Incorporates code from mikkoh and others that contributed to the referenced article. The QuadratureEncoder.h file needs to be copied into a folder called QuadratureEncoder under the libraries folder that is used by the Arduino environment so that it becomes accessible to Arduino programs. Note: Yesterday I upgraded to Arduino software version 0018. Since the upgrade I can no longer send data over the serial port and at the same time use the external interrupts and the analogWrite functions. I will update this post once I have a solution. The blue and red curves are the output of the two P5587 photo reflectors attached to Motor1. For the measurement I drove the motor as slowly as possible. Due to the diminished power the motor speed varied slightly as can be seen in the varying pulse widths. If the sensors would be perfectly aligned the two signals (blue and red) would be exactly phase shifted by 90°. However, as long as the two signals are sufficiently offset, four transitions can be accurately measured for each black & white segment of the encoder ring. 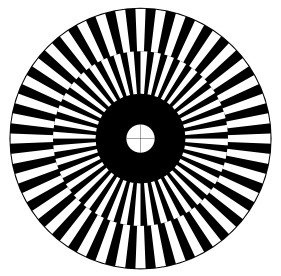 The encoder disk has 40 black & white pairs in each ring resulting in 160 transitions per full rotation. The shaft that the encoder disk is attached to makes 32 full rotations for each rotation of the wheel. 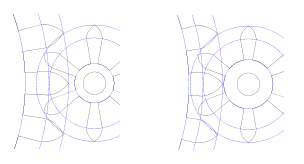 Thus I get 32 x 160 = 5120 transitions for each turn of the wheel giving a resolution of about 0.07° or 0.2mm for the 350mm (13.8″) diameter wheels. This is more than enough and in the future I will probably only use one interrupt per wheel for a resolution of 0.4mm. So, the ‘drive train’ is pretty much in place now. Next I will focus on hooking up the accelerometer and the gyroscope. Recently I started to read the excellent book Probabilistic Robotics by Sebastian Thrun, Wolfram Burgard, and Dieter Fox and got intrigued by Monte Carlo Localization (MCL). The MCL algorithm fully takes into account the uncertainty associated with drive commands and sensor measurements and allows a robot to locate itself in an environment provided a map is available.